What is the point of producing incredible content if we are not able to put it in front of the eyes of our target audience? I am sharing some writing tools to promote content efficiently and easily. These may not be the tools you have heard most often in some instances, but they are the ones which I use and have discovered over time. They offer simplicity, efficiency and do not fluff your entire budget. To all honor, the first of many tools to promote content effectively is Facebook. But not just any method of publication. I'm talking about Facebook ads here. In recent years, Mark Zuckerberg's company has placed prominently under the box of publications on your professional page, a button with the following text: "Boost this publication." This is an easy way for you to revitalize your content effectively but also, to "give" money to Facebook. For those of you who want to improve their performance using this method of promoting content, can utilize the Facebook Business Manager. It is another tool developed by Facebook but which allows having more statistics, a history of its advertising and a few additional parameters to target the right audience. A tool which must be known. Buzzsumo is a tool that allows you to study social trends on a particular keyword. Following a search on a particular keyword, you will have access to the list of people who have shared the most popular articles on this topic. Subsequently, then, you have to contact these people and offer them your content on the same subject since obviously, they have an interest in it. It's a little bit longer to get it done, but since you share your content with people who are already "pre-qualified," the game is worth it! CoSchedule allows you to share your content on all social media platforms. All in an automated way but customizable at a time. For example, you can present the same blog article from several different angles, presenting it with a different presentation text each time, changing photos or incorporating a new video for each type of publication. Days are gone, when people are given the impression of "spamming" because we share the same article several times. Thus, we reach a wider audience since we approach bits of the content from varying angles. Finally, CoSchedule ensures you to manage the interaction between the various members of your team. Editors, proofreaders, marketers. All can have access, be assigned tasks that are triggered automatically when one is over, and therefore you can save a lot of time! 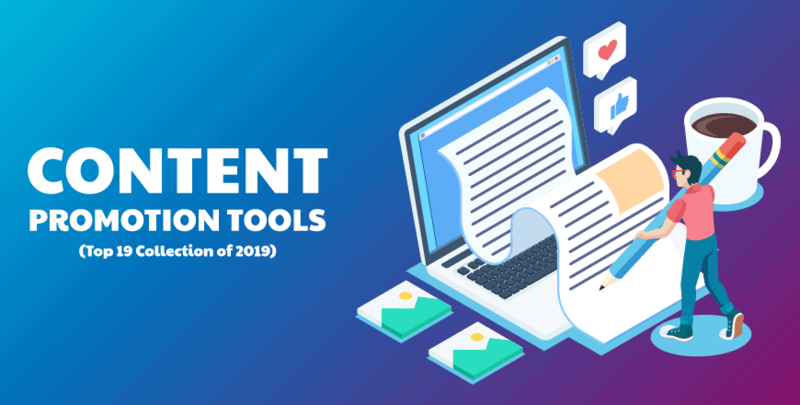 Sumo platform offers lots of credible tools for content promotion. However, the most useful features for me is the share button and list builder. Its list builder ensures you to have popups to capture emails of your site visitors, and this now can be converted to marketing leads. Social buttons are displayed on pages which notifies users of the number of shares the post have, and this is an excellent social proof. Ahrefs is much easier to use than to pronounce its name, lol! But it is a tool that ensures you situate yourself beautifully compared to your competitors. With Ahrefs, you can easily follow which are the links that point to the website of your competitors and thus be able to try to connect to these sites in turn since their interest in content like yours is obvious. IFTTT (or If this then that) is a tool that allows you to automate the publication flows as much as possible. There is also Zapier which can help you with similar tasks. Definitely, tools to analyze closely with all the options they offer. Google Alerts is a rather basic tool, but with multiple uses: it allows to monitor its e-reputation, perform a competitive watch but also to curation. Just create an alert on a keyword that interests you (e.g. "content marketing") to be informed of the latest news on the subject. Pinterest is a social image sharing network that can also be used as an excellent curation tool to find and share visual content. This smooth platform is developed with just the goal of revitalizing your social reach. Its logic is to urge your employees to distribute your content.You can also keep track of who has the most shares and also which post of yours is most successful. Netvibes is a complete solution for aggregating your news, social networks, and favorite sites and tracking them from a personalized dashboard. Buzzstream portrays itself as a content marketing CRM. Building and managing all of your contacts can be done with this platform; it even has the email sending feature. Email templates can be created and also tracked with this cool tool to ensure that the emails are opened and also note when links are clicked. The Old Reader allows you to gather the sites of your choice and to organize them freely by theme or by interest. You can then read and share relevant content with your community very easily. Quuu, is a platform where you submit your article and it will be shared across hundreds of linkedin, facebook and twitter accounts. Content producers pay to use this platform to share their contents, while sharers are these social media users who want to keep their profiles active with relevant contents. Storify allows you to enrich your own posts with external content: Twitter, Instagram, Facebook, YouTube, Giphy, Flickr, Getty Images, Soundcloud, Tumblr, Google, etc. You can also search other sources to find the appropriate content. Once the ideal content is found, users can drag and drop it into a document. At Storify, these are mobile modules based on your own content and external content. Your own texts can be highlighted as in a text editor. Once the message is ready, just click on "publish" and the article will be published in Storify. Before the content is put online, the service asks the user whether the cited authors, graphic designers or photographers should be informed, a particularly useful function when it comes to increasing the scope of a publication. There are several ways to reach your target group: users can cast their story on Twitter, Facebook or Google+, for example. For marketing professionals, the most interesting is to copy an embed code and publish it in their own blog, if the HTML editor allows it. The export function offers even more possibilities. The full article can be edited in HTML, XML or JSON. If you use WordPress, you can also use plugins to integrate the content. This platform is very similar to a platform called Triberr which we also reviewed in more details below. Its ideology is just to share other users content, and in turn they will share yours. Unlike Hootsuite and TweetDeck, Edgar is a social media sharing scheduling platform with unique features which differs from the above-mentioned platforms. Whereby the other platforms require that you add new content if you aim for more sharing, Edgar actually reshares your old contents and never stops sharing. It helps just in case any of your fans missed an update. There is no stupid question! This is the principle on which Quora is based: behind each knowledge, there is a question. When registering on the Q & A portal, users decide which topics are of interest to them. To do this, there are a large number of proposals. Then the service asks the users to inform the sector in which they work or study. Registration is complete, and you can begin to review the questions, read the answers and participate yourself as an expert. This is indeed the principle of Quora, which is not in itself a curation tool of content, but which can quite well be used as such to gather content. For content marketing, it is important to keep an eye on the interests, preferences, and needs of the target group. Quora offers a very good approach: what kind of questions does the community ask in a thematic area? Knowledge is useful for both curating content and creating unique content. But Quora's answers can also be used for curation of content. As with Reddit, the best and most appropriate answers are placed at the top, so they are directly visible. If the content curator finds them compelling and wants to share them with their community, they can do so by pressing a button on Facebook and Twitter or via a direct link. Quora has an interesting feature since the founders (two former Facebook employees) have many celebrities among the participants in their platform: for example, actor Stephen Fry, AOL founder Steve Case, Hillary Clinton and many others influential people in their field. Of course, it is possible to provide answers yourself. This allows you to establish yourself or your company as an expert in your field. It is also possible to have your own blog on the platform. Inserting links to external content instead of attracting potential customers to their own site is a problem faced by many entrepreneurs and marketing experts who use content curation. The Sniply service offers a solution to this problem. The platform allows its users to create a call-to-action button that appears in shared content and links to their own website. How does it work? First, the content curator creates a CTA button. He can customize his appearance (small button or footer wider), then enter the address of his website and the text of his choice. Than the actual curation begins, where the web content is inserted into the clearly arranged dashboard. With one click, Sniply creates a new link. If it is shown on social media instead of the original link, the CTA button always appears when the linked web page is displayed. By scrolling through the content, the reader never loses sight of the curator's recommendations. To facilitate snipping, the platform presents users with a browser extension. The links created can be dispensed via a buffer or Hootsuite, and directly on social media. Sniply presents another useful additional feature: the tool also functions as a link reducer. The snip (so-called hyperlinks) that has just been issued by the service is always a short link in the format "snip.ly /…". However, some users don't like this type of links because they transform the website to which the click leads. Therefore, you can also use your own domain. To do this, the name servers must direct to Sniply. The link created by Sniply has even more advantages: since the redirection to the content is always done via Sniply, the tool can analyze the behavior of the target group. Sniply Analytics collects data such as clicks, conversions (that is, the number of visitors who have followed the CTA button), and time spent on the website, or bounce rate. You can also use custom scripts to link other analytics tools, such as Google Analytics. The A / B test is the perfect marketing tool to improve statistics. You then insert several variants of buttons for the same link. The system automatically presents the different versions and determines which one gives the best results. However, this is only possible with the paid version. Triberr allows you to find the right person for any subject. And popular people, often called influencers, can significantly increase the reach of selected contributions if they share them. Registration is very easy via interfaces to your own social media accounts: Twitter, Facebook, and LinkedIn are available. Then users can join the tribe, or tribes, that is, communities of interest. However, there are still several tribes with different orientations within a division (for example, "design" or "podcasts"). To make the overview easier, you can only display tribes with a certain range (calculated from the number of Twitter followers of members) or a minimum number of members. However, before users can become members themselves, they must first be "simple" followers. Only then can the leader, that is the creator of the group, promote the follower to the rank of a member if he wishes. This system guarantees the quality of the contributions in the tribes. Triberr not only provides a moment to learn about influencers but also provide the option to broadcast the content. Contributions emerge in the feed of each member. In addition, you can share your own contributions in social media. Those who particularly appreciate the content of a member of a tribe can even switch to Auto-Share, and automatically forward each of its contributions to their own subscribers on social media. Beyond curation and content marketing, Triberr is particularly interesting for the influence marketing. Marketers can use the podium to create campaigns that bloggers can join and then write about the brand. An algorithm makes it possible to select the most suitable influencers. Triberr can also deal with contracts and the payment of influencers. In principle, the service is wholly free. Both Lite and Prime subscriptions offer the same features, but their reach is increased in each case: with premium versions, you can create more tribes, connect more blogs and social media accounts to your profile, and import more messages. Again, this is a technique that is not quick to achieve but is still quite simple despite everything. It is simple to analyze with the help of tools like BrokenLinkCheck for example, broken links on a site for which you would like to have an inbound link. Once you have done this exercise, first provide the information on the broken links on the site. Then, suggest to its owner links from your site that can replace these broken links. It's a safe bet that they will agree to do so in return for the service rendered.